Location of Savegames on Mac? Amanita Design forum > Botanicula > Botanicula on Mac (Moderator: Lamkin) > Location of Savegames on Mac? I'm trying to transfer my Savegames from a Windows PC to Botanica on a Mac. Where can I find the Savegames on Mac? Re: Location of Savegames on Mac? All my Folders are visible! But there is no Amanita folder with my savegames anywhere! I hope someone can help me find my savegames on my Macbook Air! Are you playing on Steam? No, i don`t play on steam! Well, assuming you're following the file path, it should be there. Try using Spotlight; search for: slotauto.bin. Eh, maybe you typed it right in Spotlight and it's still not showing up. You could try pressing Shift-Command-G while in the Finder. In the window, type "~/Library/Application Support/Amanita Design/Botanicula" (without quotes). Ah. I'm assuming that the English word "Library" needs to be typed in German. So does "Application Support". No, i don`t think so! You might try looking in the Dokumente folder that's inside your Home folder. Look for a folder that says BotaniculaSaves. 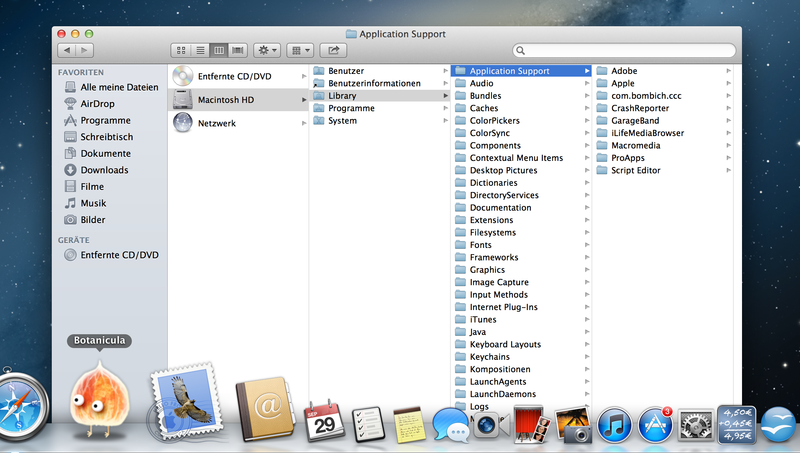 On my whole mac is nothing named Amanita or BotaniculaSaves!